Anyone else have an imaginary friend as a kid? Supernatural Season 11 Episode 8 revealed Sam had one when he was younger, or at least he had a Zana by his side while Dean and John were off hunting. As for the Supernatural Round Table panelists? Well, you’ll just have to read on to find out! 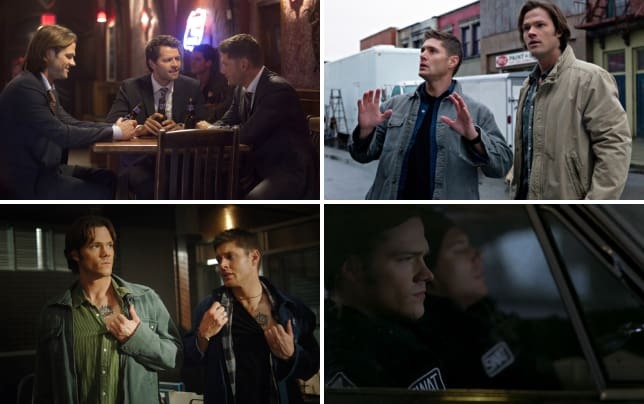 Plus, TV Fanatic staff writers Sean McKenna and Christine Laskodi and The Winchester Family Business’ Alice Jester and Nightsky talk about the addition of Sully and that Sam and Dean car conversation. Christine: When Dean, totally confused by Sam's erratic behavior and Sully's sudden appearance, offered to go get his gun. That line really got me. Dean's immediate solution is always to get his gun, even in that harmless situation. Oh, Dean... never change. This scene inspired me both as a person and as a parent. Can we ever love and trust ourselves or our children enough to give permission to do the wrong thing when we know we/they are strong enough to do the right thing? As for scene (yes, I’m giving both), I’m going with the opening scene in the kitchen when Sully surprised Sam. Marshmallow covered nachos? How awesome! The way that whole scene was shot and written, with both Sam and Dean coming to terms that this imaginary friend was real, was brilliant and quite funny. Dean especially was a riot, wanting to fetch his gun and then going all Dad mode with Sam. Sam actually sulked when ordered to the library! Sean: I really liked that car conversation at the end of the episode. It totally could have been a repeat of the one on Supernatural Season 11 Episode 7, but Sam brought the cage up again and pushed for a different answer from Dean. Especially, after his conversation with Sully, it really got him to be open with Dean without just running off and doing something on his own. It’s great when the two try and work together, even if they have different ideas of what to do. Did you ever have an imaginary friend when you were a kid? Christine: Yes. I had two. Alvin and Theodore Seville, two members of Alvin and the Chipmunks. Simon never joined us because in my child mind he died in a science experiment gone awry. Oddly, no one ever questioned it. I was a super weird kid. Nightsky: No, but meeting Sully, I might just make one up now. Alice: Define imaginary friend. Judging by this episode, she may have been real after all. Oh, who am I kidding, no. I spoke to the dog a lot. He always understood me. Sean: I never had one either, but if they were anything like the Zana, then at least I’d be in good hands. I couldn’t help but think of “imaginary friend” Toby from the “Paranormal Activity” movies. That’s not a nice friend at all. 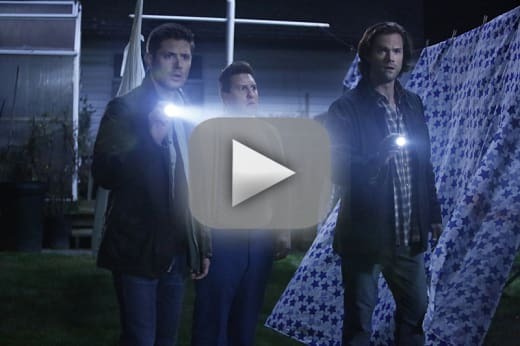 Was the addition of Sully and the other imaginary friends too wacky for Supernatural? Christine: No wackier than the suicidal teddy bear in Supernatural Season 4 Episode 8. I like the occasional totally odd episode of the show, but I think the placement of this one was a bit off, especially coming off of such a strong monster of the week episode like Supernatural Season 11 Episode 7. It also had a sloppy conclusion, which I didn't love. But it served its purpose. Nightsky: Not at all. Being introduced through lore satisfactorily placed them in the realm of the believable. The Supernatural universe includes tricksters, cupids, angels, and so many other invisible beings that influence and explain much of what happens in our lives. I totally accepted the existence of the Zana. To me, they are interactive, friendly guardian angels to children. Alice: Do you not watch this show? Anything put to paper by former writer Ben Edlund far exceeds this humorous but not totally out there imaginary friend tale. They actually made imaginary friends plausible. I think limits were really pushed when the whole alien abduction phenomenon was explained away as fairies. Or when Sam and Dean were sent to a world with a Jensen and Jared and had to play Sam and Dean as Jared and Jensen. 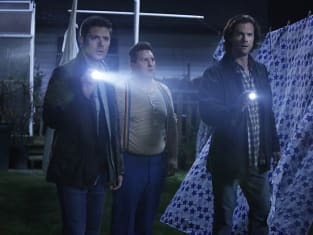 Or when Sam and Dean were stuck in TV land and forced to act as doctors in a medical show, crushed in the nuts on a Japanese game show, pitched a drug for genital herpes, forced to act in a bad 80s sitcom, got caught in a bad procedural cop show and then Sam became the KITT car (full credit to Carver for those insane ideas). Yep, this episode didn’t even come close. Sean: Well, when you put it that way, Alice… But yeah, this wasn’t some over-the-top episode that didn’t work, and I like how the “imaginary friends” were like guardian angels. It fit in with the Supernatural universe, and while I liked parts, I was more lukewarm for the episode as a whole. Do you like getting flashbacks of Sam and Dean when they were younger? Christine: Not always, but I think in this case, it was important. Sam invented Sully because he was emotionally abandoned by Dean and John, and needed someone to talk to. Adult Sam needed to talk to Sully because he's in a similar situation now, and while he didn't call on him to show up, he needed to be able to talk through what he's feeling, and Sully conveniently was there at the right time. Dean keeps shutting him down, while Sully encourages Sam and tells him how proud he is of him. Sam needed that, and we needed that flashback information to connect those feelings. Nightsky: They are always risky, but I’ve never been disappointed. This was done very well, deepened the main characters’ backstories (which is amazing after 11 years) and advanced the current myth arc. The flashbacks were also immensely strengthened by continuity – with actor Dylan Everett (young Dean), the motel room shown in Supernatural Season 1 Episode 18 (“Something Wicked”), dialogue about Sam’s broken arm when trying to fly, wondering about running away from the life, being advised to go to school instead of hunt, etc. So yes, I loved getting more flashbacks! Alice: Sort of. I do admit that I missed seeing Colin Ford as young Sam. That’s the problem with long running shows though, eventually the kid actors grow up! I liked the new one, but flashbacks do lose a bit of their luster when it’s a different actor most of the time. I think they’ve been done enough where I don’t want to see them too often, but in the case of this episode, where it enhances the story, it worked for me. Sean: They were fine, but yes, it was weird for me to not see Colin Ford. I’ve been so used to him as young Sam, that it was a bit jarring at first. I liked at least what the flashbacks were establishing, but I’m also OK when the series doesn’t use flashbacks either. What did you think of Sam and Dean's final conversation in the car? Christine: I'm happy that Sam isn't letting it go for the sake of appeasing Dean. Sam knows that something isn't right and that these visions are being given to him for a reason, despite not being quite sure who is sending them. He's standing his ground, and that's admirable for Sam. Jared Padalecki has really been killing it all season. Sam's been a rock and has yet to disappoint me. Nightsky: I was perfectly OK with it. Dean can’t begin to consider Sammy going back to eternal torture in the cage because he loves and wants to protect his brother, and Sam telling Dean (in his own way) that he had made up his mind. Anything more would have been redundant and taken away from the story we were already presented about Sam’s personal journey through his fear. Alice: It was good and about time. I like that Sam’s encounter with Sully gave him the confidence to push the issue with Dean this time and not let it go when Dean gets surly. It also gave me some hope that Sam won’t try to venture out on his own and will face this extremely scary situation with his brother by his side. Of course, next week could prove me wrong. Or it could prove me right! Sean: I loved this conversation! It wasn’t redundant from the last one they had, and Sully’s talk did allow him to press Dean on the issue. It’s good to see him not just head off on his own and instead try and get Dean to work with him. The cage means something huge, but I just hope Sam and Dean can figure out their next move together. And before Supernatural Season 11 Episode 9 on Wednesday, catch up on all the episodes when you watch Supernatural online now!